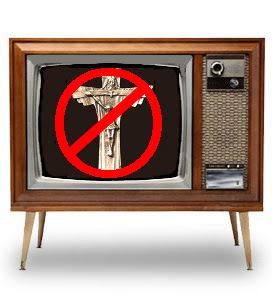 The Parents Television Council has released a handy guide for secularists to the television networks least likely to have religious views intruding into prime time. Well, I guess that probably wasn't the intent, but that's what they wound up doing. And the good news is that the prime-time programming on the six commercial broadcast networks for the 2005-06 season has seen a 39 percent drop in depictions of religion from 2003-04. PTC President Brent Bozell expressed disappointment that the box office smash, "The Passion of the Christ," by Mel Gibson, well-known in police circles for favorable depictions of people of faith, has not translated into an increase in televised religion. [W]e saw a slew of stories about how ‘Hollywood has gotten religion’ and how Hollywood was seeing the value of programs that had religious themes. If you look at the study that we’re releasing today on the state of prime-time broadcast television, you will see that not only did that message never reach the executive suites of the television networks but that, in fact, the television networks have gone in the completely opposite direction from the public mood. [The] television entertainment industry is completely disconnected with American public opinion. According to the study of ABC, CBS, NBC, Fox, WB and UPN the portrayals of religion were 35 percent negative, 34 percent positive and 27 percent neutral or mixed. I know that may sound like rather scrupulously balanced treatment to secularists but who cares about your opinion? What could be a more negative depiction of faith than people who do not believe in God and who actually dare to express it? And to say that you don't want to accept Jesus Christ as your personal Savior is ... is ... why, blasphemy! In something of a surprise, Fox lead in the negative portrayals of religion, with 50 percent of its depictions in that category. CBS led in positive depictions, with 47 percent favorable. UPN had the fewest portrayals at one for every five hours, compared to the overall average was one for every 1.6 hours. It also was last in positive portrayals, with only 19 percent. ABC had by far the most overall depictions of religion at an average of slightly more than one per hour. Reality shows, such as "The Amazing Race" and "Extreme Makeover: Home Edition," treated religion more favorably than scripted dramas and comedies, according to the study's standards. Reality shows accounted for 58 percent of the positive portrayals on the networks while scripted programs had 96 percent of the negative depictions. The lesson: if you don't want to be bothered, watch non-reality shows on UPN. Or, better yet ... turn the damn thing off. Or does that amount to the same thing?